North Platte Lodge is the original fly fishing and wingshooting lodge located on the Grey Reef section of the North Platte River. 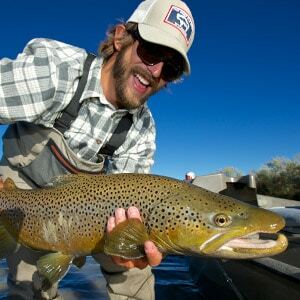 Established in 1998, it has specialized in Wyoming fly fishing vacations for nearly two decades. Miles of exclusive river access, full outfitters services and our renowned The Reef Fly Shop compliment clean, comfortable, spacious rooms. Come meet your gracious hosts, fish with our top-shelf guides, and experience front-door access to some of the best public and private trout waters in the West. Sip a cup of coffee from your open veranda, watch the sun shake loose, then lace up boots and charge into the day. This is quintessential Wyoming: raw landscapes where four-season fisheries teem with wild browns and rainbows, and where Western fishing culture is interwoven into authentic experiences on and off the river. Start your next best fishing and shooting holiday at North Platte Lodge today—because it doesn’t get this good until you show up. 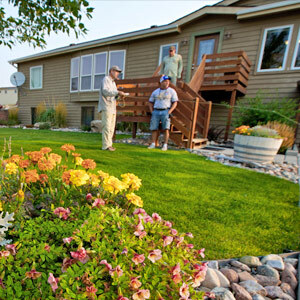 North Platte Lodge is the only full-service outfitter and resort located on the renowned Upper Gray Reef fishery and thus enjoys unmatched river access set aside exclusively for NPL guests. Step out from one of six spacious, well-appointed rooms, gear up at The Reef Fly Shop, and within minutes you’ll be exploring our diverse trophy-trout home waters. At North Platte Lodge nuanced North Platte River tailwaters—including the Grey Reef, Miracle Mile, and Fremont Canyon—are our everyday stomping grounds. 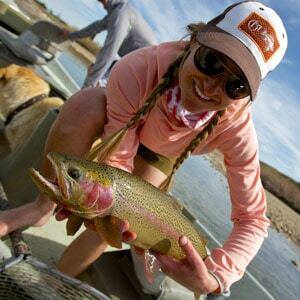 These trout fisheries are also surrounded by spectacular countryside, where Wyoming hunting adventures abound. For cast-and-blast pursuits, with a distinct Western personality, NPL is a grand nexus for nonstop action. North Platte Lodge is proud to present you with the most accurate, up-to-date fishing conditions at Grey Reef. The Reef Fly Shop’s weather station is steps away from the river. Streamflows come directly from the Bureau of Reclamation and automatically update as new information is added. 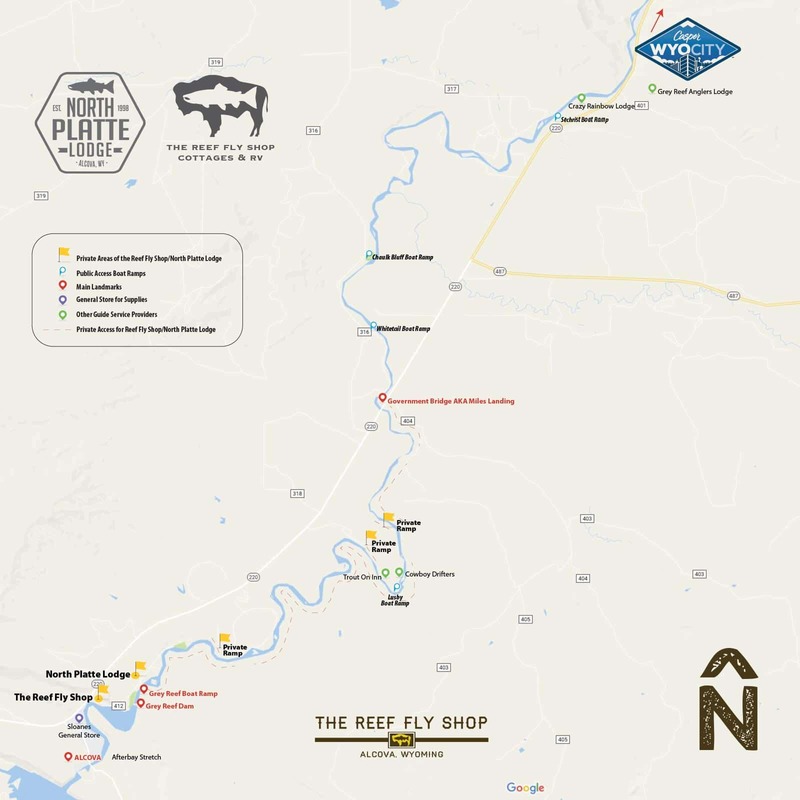 Follow the link for current stream conditions on the North Platte from The Reef Fly Shop. Private access is a rare commodity in Wyoming and this is what our North Platte River fly shop and North Platte Lodge provide exclusively for our guided fly fishing guests. In Wyoming, the water is public domain, but the land underneath belongs to the private landowner. 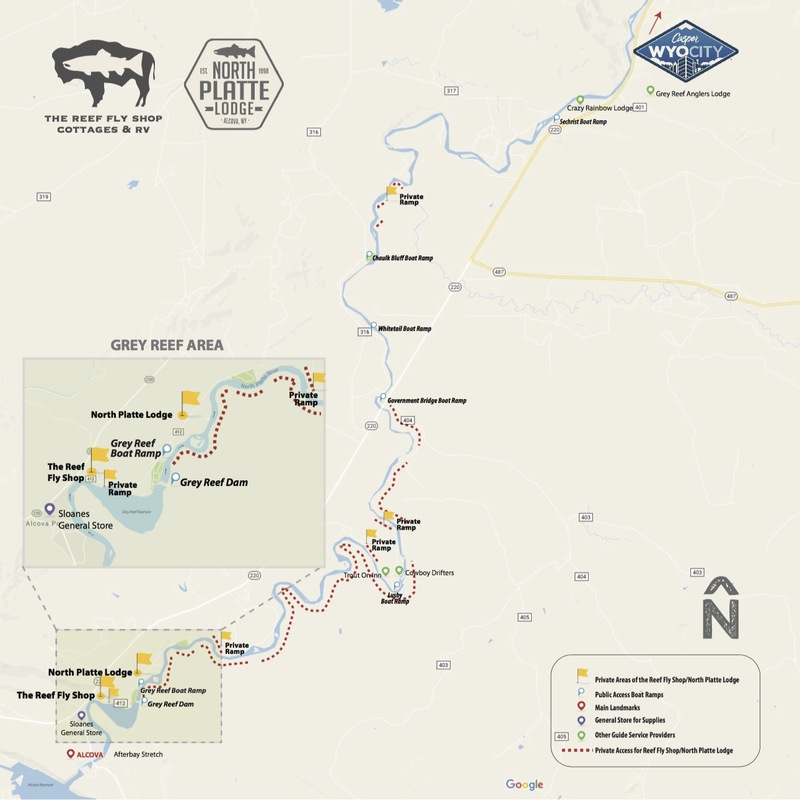 The Grey Reef section of the North Platte River is mostly private, but with our fly fishing guides you can fully experience Upper Grey Reef, where we have 17 miles of exclusive private access and 5 private boat ramps.